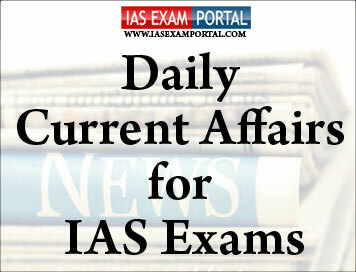 Current Affairs for IAS Exams - 11 August 2018 | IAS EXAM PORTAL - India's Largest Community for UPSC Exam Aspirants. The President of India, Shri Ram NathKovind, inaugurated the ‘One District One Product’ Summit today (August 10, 2018) in Lucknow. Speaking on the occasion, the President said that micro, small and medium enterprises are called the backbone of our economy. These enterprises are engines of inclusive development. After the agricultural sector, most people find employment in this sector. He expressed confidence that the ‘One District One Product’ scheme will enhance skills of local people as well as increase the reach to products. And it will result in economic progress of artisans of Uttar Pradesh. In an urgent mentioning, a three-judge Bench led by Chief Justice of India DipakMisra heard advocate Varun K. Chopra representing the senior Congress leader. The court decided to examine the petition, in which both the Election Commission of India and the State poll body are arraigned as respondents. Election Commission is the watchdog of free and fair elections and is duty-bound to circumvent the pressure and ascertain that the ensuing elections are free from any impediments, in order to uphold the democratic sanctity and fundamental rights of the voter,” the petition settled by senior advocate VivekTankha said. The petition said senior leaders from MP had submitted a detailed representation in June 2018 to the Commission highlighting the inclusion of “60 lakh duplicate, repeat, multiple, illegal, invalid and false entries/voters in the electoral rolls of Madhya Pradesh for Assembly elections, 2018. It said mock polls were done on only five per cent of EVMs and VVPATs in a constituency. “It is imperative that at least 50% of EVMs and VVPATs are brought under the purview of mock poll to reduce the margin of error and increase the trust of the electorate. India will triple its ethanol production over the next four years till 2022 and this will save Rs. 12,000 crore in the country’s oil import bill, Prime Minister NarendraModi said on Friday, which is being celebrated as World Biofuels Day. The Prime Minister also blamed the previous government for not encouraging the production and adoption of ethanol, saying his government has planned 12 biofuel refineries in the country at an investment of Rs. 10,000 crore. Now we will produce 450 crore litres of ethanol in the next four years from the existing 141 crore litres. This will result in an import savings of Rs. 12,000 crore.” The government will achieve 10% ethanol blending in petrol by 2022 and is aiming to double it to 20%,” Mr.Modi added. India needs to adopt a holistic approach to meet the consistent targets of ethanol blending, which this government has been maintaining at abysmal levels (2% currently as per the policy document itself). Securities and Exchange Board of India (SEBI), vide circular dated April 27, 2007, has mandated that PAN would be the sole identification number for all participants transacting in the securities market, irrespective of the amount of transaction. In the case of securities also, giving / taking delivery of securities in “demat mode” should be directly to / from the “beneficiary accounts” of the clients except delivery of securities to a recognized entity under the approved scheme of the stock exchange and / or SEBI. Further, SEBI has brought to the notice of SEBI registered market intermediaries the various notifications issued by the Government of India on Prevention of Money Laundering Rules, relating to making Aadhaar number issued by the Unique Identification Authority of India (UIDAI) and Permanent Account Number (PAN) or Form No. 60, as defined in Income Tax Rules, 1962 mandatory for both new and existing accounts with financial market intermediaries including securities market intermediaries. Moreover, SEBI registered intermediaries are required to follow stringent KYC norms on an ongoing basis and are also required to file Suspicious Transaction Reports (STRs) to the Financial Intelligence Unit (FIU) in case of suspicious activities of their clients. Appropriate action against evasion of taxes/black money, including against cases involving black money investments, is an on-going process. Such action under direct tax laws includes searches, surveys, enquiries, assessment of income, levy of taxes, penalties, etc. and filing of prosecution complaints in criminal courts, wherever applicable. Colombia and Brazil, which share borders with Venezuela, have borne the brunt of the regional humanitarian emergency brought on by the near total collapse of the Venezuelan economy. But with the crisis deepening, the “influx is now accelerating” into Ecuador and beyond, with some people making arduous weeks-long journeys on foot before finding a place to settle, the UN refugee agency (UNHCR) said in Geneva. The UNHCR said Ecuador’s state of emergency declaration would help mobilise more resources. As part of Shanghai Cooperation Organization (SCO) initiatives, SCO Peace Mission Exercise is conducted biennially for SCO member states. The joint exercise for the year 2018 will be conducted by Central Military Commission of Russia from 22 August to 29 August 2018 at Chebarkul, Chelyabinsk, Russia. This exercise marks a major milestone in the multilateral relations of SCO member nations. The exercise will involve tactical level operations in an international counter insurgency or counter terrorism environment under SCO Charter. Indian contingent of 200 personnel is primarily composed of troops from infantry and affiliated arms & services alongwith Indian Air Force. The Indian contingent has been put through a strenuous training schedule which includes firing, heliborne operations, combat conditioning, tactical operations and house intervention drills. The Union science ministry’s communication wing, VigyanPrasar, has launched the India Science Technology and Innovation portal that can help with such queries. According to a roadmap prepared by the Union government, the Science Ministry proposes to spend Rs. 15 crore over five years to cover costs of portal development and updates. Many parts of Northern Kerala are completely isolated by landslides and floods due to heavy rains. Kerala state government had requested IAF to provide urgent assistance in Wayanad for providing relief to the affected people. Two Mi-17 V5 helicopter and one Advance Light Helicopter (ALH) has been pressed into service for distribution of relief material and winching operations. On 09 Aug 18, three persons were winched to safety by IAF helicopters and 300 Kg of relief material was dropped for flood affected people. Owing to their poor run of form at the World Championships, SainaNehwal dropped out of the top 10 while K. Srikanth slipped two places to eighth in the latest BWF rankings. Saina lost a place to be 11th. P.V. Sindhu, who clinched her second successive silver at the event, retained her third spot. H.S. Prannoy, who also lost in the second round at Nanjing, remained 11th. Appointed a Cricket Committee comprising of international players of repute who have contributed greatly to Indian cricket. Members of the Cricket Committee are VirenderSehwag, Aakash Chopra and Rahul Sanghvi. Selection process of selectors, coaches, managers and physios has been completed in a very professional and transparent manner independently by the cricket committee. The DDCA, however, has held back the announcement of the coaches for different teams after having picked the selectors.